Habitat : Throughout india, found in the plains, forests, hilly slopes and outskirts of the forest upto 900m. Uses : The leaves and roots have emetic, cathartic, laxative, expectorant, diaphoretic and purgative properties. It has also been used for the treatment of allergies, cold, dysentery, hay fever and arthritis. 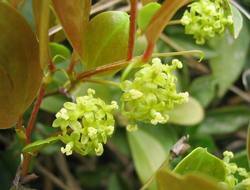 It has reputation as an alterative and as a blood purifier, often used in rheumatism and syphilitic rheumatism. Root or leaf powder is used in diarrhoea, dysentery and intermittent fever. Dried leaves are emetic diaphoretic and expectorant. It is regarded as one of the best indigenous substitute for ipecacuanha. The roots are suggested to be a good natural preservative of food. It is traditionally used as a folk remedy in certain regions of India for the treatment of bronchial asthma , inflammation , bronchitis, allergies, rheumatism and dermatitis. It also seems to be a good remedy in traditional medicine as anti-psoriasis, seborrheic, anaphylactic, leucopenia and as an inhibitor of the Schultz-Dale reaction. The roots are suggested to be a good natural preservative of food.